We at Kobricks Coffee have been huge fans of Antica Tostatura Triestina since we first discovered this delicious coffee back in the mid 1990s. It is one of the finest examples of the Northern Italian espresso tradition, blended and roasted in small batches with passion and superb attention to detail that are the hallmarks of great specialty coffee. "Passion transformed into taste. The name of my Company and its products have been dedicated to the traditions of the City of Trieste from which we spring. Traditions that have been with me from birth, instilling in me a passion for excellence that I in turn will pass on to my sons." "There are no more than five basic tastes, yet their blending produces endless varieties" Sunzi - China 770 B.C. ....only few however can achieve iconic status, or become world renowned landmarks. As a result, our drive for quality is a constant and all-consuming passion, helping to maintain the key elements of what should make your experience of our truly Italian espresso coffee, so special, anywhere in the world. 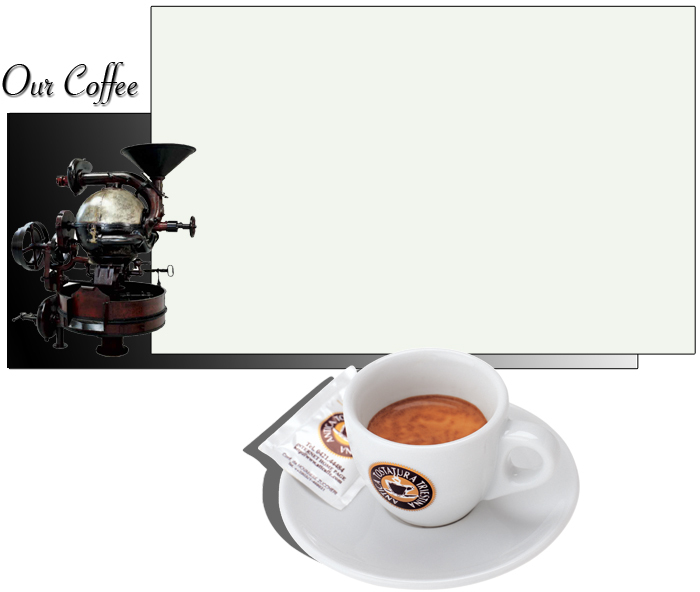 A coffee that stills time So you can be with your thoughts No matter where you are."